Visit the shop to see a full range of products for use in bathroom, shower room and toilet – stools, long handled sponges, raised toilet seats and frames, grab rails, non slip mats to name a few. 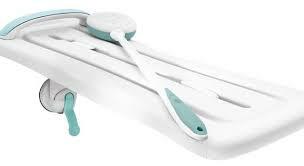 These include grab bars, bath seats and benches, bath lifts, long handled sponges, shampoo basins and shower stools. To help with toileting, raised toilet seats, frames and commodes, urine bottles and bed pans. We also stock a range of accessories for carers such as vinyl and latex gloves, care wipes and much more. You will also find a large range of incontinence products both washable and disposable for men and women including bed and chair pads. Having trouble getting in and out of the bath? We have a number of solutions. Choose from a simple bath board to an electric bath lift or talk to us about installing a walk in bath or new accessible shower. The Bellavita bathlift is the lightest reclining bathlift available. It separates easily and quickly into two sections for ease of removal for cleaning or transportation. 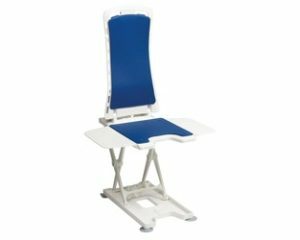 It reclines to a market leading 50 degree angle and goes lower in the bath than any other bathlift for the best bathing experience. It also goes higher than other bathlifts to enable safe, level transfers for those who may have a deeper bath. A built in safety feature prevents the bath lift from lowering without sufficient charge to return it to the top of the bath. The lightweight hand control is fully waterproof and floatable,has an emergency stop button and is easily charged between uses. White or blue washable covers provide extra comfort and hygiene but the bath lift can be purchased without these if desired. We keep a Bellavita bath lift on display in the shop and can order other makes and models of bath lifts. The swivelling bath seat sits across the top of the bath and enables you to rotate your body and legs into the bath. The backrest and arms offer additional support. The easy to clean seat smoothly rotates by lever, locking every 90 degree interval. Drainage holes prevent water spillage. Bath boards or bath benches, as they are sometimes known, fit across the top of the bath to facilitate access in and out of the bath. 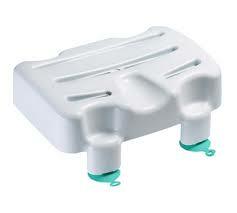 Many people use them as seats to shower over the bath to save getting lower down into the bath. Choose from various styles and shapes, the bath boards adjust to the width of the bath and are easy to fit. Come into the shop to see this range of useful accessories for the bathroom and toilet. Raised toilet seats are available in 2″, 4″ and 6″ depths, with or without a lid. Padded toilet seats that strap to the seat can be useful for travel and make a hard seat more comfortable. Toilet frames provide support getting up and down onto the seat and have non slip rubber ferrules. Cast and bandage protectors keep wounded areas of the body dry when showering. A range of shower stools include round, corner and stools with handles, all height adjustable and lightweight. Grab rails are an important addition to help steady you in the bathroom and shower. Available in various lengths and styles. Long sponges, lotion applicators, shampoo basins and urinals make up the rest of the products available in this range.